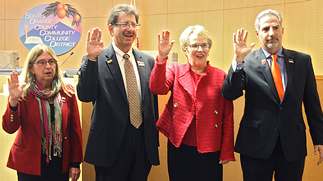 Trustees Tim Jemal, Dave Lang, Terri Whitt and Bobbe Jay were sworn into office after successful re-elections. Trustee Jim Wright was absent and will be sworn in at a future meeting. The board of trustees conducted their annual organizational meeting and facilities corporation meeting. The board leadership positions remain unchanged as Tim Jemal, President; Jim Wright, Vice President; and Dave Lang, Clerk. 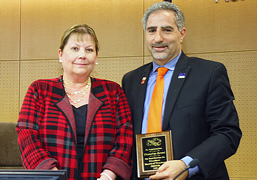 Interim Chancellor Debra Fitzsimons presented Trustee Tim Jemal with a plaque to thank him for his service this year as board president. She presented Trustee Dave Lang with a pin to honor 20 years of service at the district. All consent calendar items, general action items, and academic and classified personnel actions with changes to 2.5 (board meeting calendar.) For additional information, please contact the Chancellor, College President or appropriate Vice Chancellor. Irvine Valley College Curriculum Revisions for the 2017-2018 Academic Year. Irvine Valley College Spring 2017 Community Education courses, presenters and compensation. Saddleback College curriculum changes for the 2016-17, 2017-18 and 2018-19 academic years. Saddleback College grant award of $211,271 from U.S. Department of Health and Human Services, Health Resources and Services Administration for the Behavioral Health Workforce Education and Training for Paraprofessionals (BHWET). Board Room Audio Visual System project with Western Audio Visual in the amount of $189,582.14. Work order with Neudesic LLC for an amount not to exceed $198,000 to implement new features for the Student Information System (SIS). District, Retiree OPEB Trust, Saddleback Foundation, Irvine Valley College Foundation, ATEP Foundation, and SOCCCD Foundation FY 2015-2016 audit reports with the highest possible ratings. Procurement of District-Wide Network Security Firewall equipment from Optiv Security, Inc., for an amount of $699,512.69. Assessment of alternate options for the Saddleback College Advanced Technology and Applied Science (ATAS) building project. Board Policy Revision: BP-109 Board Education. Resolution No. 16-33 to approve revised Conflict of Interest Code, subject to review and approval by the Orange County Board of Supervisors. Payment to Trustee Terri Whitt who was absent from the board meeting on November 14, 2016. Trustee Prendergast attended the OC Pathways Showcase (ocpathways.com) and encouraged everyone to view roadtripnation.com for an opportunity to go on the road to assist students looking for mentorship. He attended the SC Feast of Lights, nurses pinning, and college holiday functions. Trustee Jay attended the board training session, Feast of Lights (twice) where enjoyed seeing Trustee Milchiker sing. She also attended the IVC foundation board meeting, nurses pinning, and SC President's Circle holiday luncheon where $53,000 was raised. Trustee Jemal attended the OC Pathways showcase. He was a panelist at an OCBC workforce development meeting to discuss state and local politics and positive impacts to education following the passage of Propositions 51 and 55. 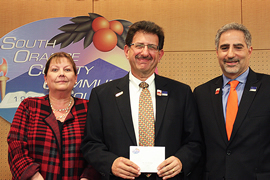 He attended the board training session, holiday open house at SC, and holiday lunch at IVC. He commended Trustee Jay for her generous contributions to both college foundations and commented that she has really stepped up her commitment. Trustee Lang was on vacation and missed some of the recent events. He wished everyone a happy holiday. Trustee Milchiker had an opportunity to sing with the choir for Feast of Lights which gave her an appreciation for how much work (and fun) it is. She attended the OC Pathways showcase, and a meeting of the OC legislative task force. She offered warm wishes for 2017. Trustee Whitt enjoyed the nurses pinning and Feast of Lights event. She especially enjoyed watching President Burnett conduct the orchestra. She attended OC Pathways and plans to sign up for the road trip nation opportunity. She feels blessed to be a part of our district and colleges. Student Trustee Forde attended the board training session and enjoyed it as an observer. He attended a post-election open forum at IVC. He expressed concern over students' strong feelings of fear and angst regarding the election and possible future actions that may affect students and higher education. He urged the colleges to conduct more forums to encourage open dialog. Interim Chancellor Debra Fitzsimons thanked everyone who stepped up district-wide to work collaboratively on the two accreditation reports which have been finalized. She asked them to stand and be recognized. She offered congratulations to Rosie Aguilar, 2016 District Services Manager of the Year. Rosie is the district's payroll and benefits manager. She supervises a team that takes excellent care of our employees and keeps the district stay compliant. Her positive attitude is inspiring and people enjoy working with her. She recognized Trustee Tim Jemal for his service last year as board president and presented him with a plaque. She also thanked all of the board leadership for their service. She congratulated Trustee Dave Lang for 20 years of service and presented him with a pin to commemorate his service. Finally, she offered sincere wishes for a peaceful, relaxing holiday break and thanked the faculty and staff for another successful semester. Saddleback College - President Tod Burnett's written report included: The OC Pathways Showcase was held at the Marconi Automotive Museum to highlight the grant program initiated in 2014 by the California Department of Education that connects educators and industry leaders to equip students for college and career success. Led by Saddleback College and the Orange County Department of Education, OC Pathways comprises 14 school districts, nine community colleges, multiple universities, numerous regional agencies, and scores of industry and community partners working together to prepare Orange County students for high-demand, high-skill, and high-wage careers. The OC Pathways Showcase, entitled "The Ultimate Road Trip," highlighted college and high school students who have held internships in the STEM (science, technology, engineering, and math) fields made possible by the grant. Dr. Burnett and Jeanne Harris-Caldwell, director of the Student Health Center, led a presentation at the Community College League of California annual convention in Riverside entitled, "Campus Crisis: One College's Strategy for Dealing with Student Mental Health and Wellness." Three new student services managers were welcomed to Saddleback College: Dr. Georgina Guy, dean of transfer, career, and special programs; Amber Gallagher, director of financial assistance; and Christopher Hargraves, director of student life. The Saddleback College Nursing Program honored 59 graduating nursing students in a symbolic candle lighting and pinning ceremony. Each graduate received a time-honored pin, a symbol of a nurse's service to others, and their induction into the nursing profession. He congratulated Anthony Maciel, Jim Rogers, and Sophie Miller-Gilliland as SC Managers of the Year. Irvine Valley College - President Glenn Roquemore’s written report included: The College hosted the annual Veterans Day Commemoration. IVC student veterans Rachel Bartlett, Eric Grohman and Matthew McBee, all of the US Marine Corps, participated on a panel moderated by Director of Health, Wellness and Veterans Nancy Montgomery. lVC Model United Nations (MUN) program hosted its sixth annual Southern California MUN Conference. This is the first of three service-learning events that IVC MUN students organize every year to raise awareness of global challenges and promote global citizenship. IVC and Mike Salviani, professor in the department of Computer Information Management, hosted the CyberPatriot Qualification Round. CyberPatriot is the premier national cyber defense competition that brings together multiple skills for middle and high school students to work together as a team in a virtual environment to solve real-world cybersecurity problems. The American Association of Community Colleges and the National Science Foundation presented IVC with a plaque in recognition and appreciation of exceptional efforts to advance technological education through the MentorLinks program. IVC men's soccer team defeated Norco College with a 6-1 victory, ending the regular season. Their win placed them in second overall in the Orange Empire Conference (OEC), enabling the team to head into the Southern California Regional Playoffs for the postseason President Roquemore called attention to the accreditation efforts and a shift to prepare for the visiting teams. Nancy Montgomery and Karima Feldhus were selected as IVC's Manager/Administrator of the Year. Leaders from the colleges' accreditation steering committees presented the Saddleback College and Irvine Valley College final accreditation reports which are published on the colleges' accreditation sites: Saddleback Accreditation / IVC Accreditation. Vice Chancellor of Technology and Learning Services Bob Bramucci, SC Technology Director Anthony Maciel, and IVC Technology Director Bruce Hagan provided an overview of their technology plans. The board meeting may be viewed online at www.socccd.edu. Television broadcasts are scheduled for 7 pm on Friday, December 16 and Saturday, December 17 on SC Channel 39 and IVC Channel 33. SC TV 39 has an additional broadcast on Sunday, December 18 at 7 pm.